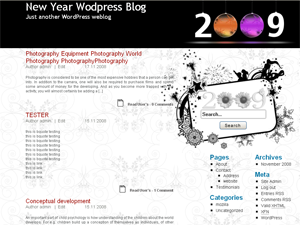 A unique looking black and white colored three columned theme fixed width theme that focuses on the arrival of the New Year. The header of the theme is simple and yet elegant looking for its sober color scheme of black and white with colorful christmas decoratives in the circles. The background of the content area and the two sidebars has an elegant looking pattern with floral patterns. The content area has red colored titles that uplift the beauty of the theme and displays the latest updates on the websites. The sidebars feature a unique search area for the users that is distinctly focused in the complete theme. Each sidebar displays the various links to the information’s in the website and has blue colored sidebar titles.